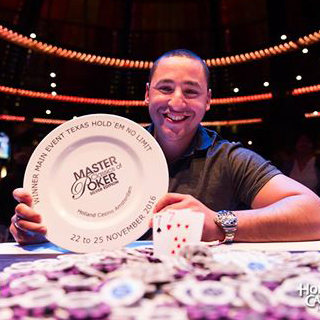 Congrats to Hakim Zoufri who has given his live poker career a major boost after taking down the Silver Edition of the Master Classics in Amsterdam yesterday. The €4,000 + €250 buy-in Main Event had to go in to an unscheduled day of play when Zoufri and heads-up opponent Fabio Sperling had still not resolved their battle by 3am on Friday. Returning on Saturday, it only took half an hour however for Zoufri to seize victory and the €275,608 first prize. Zoufri now has more than $400k in live tournament winnings. There were 365 entries in the €4,250 Main Event creating a prize pool of €1,409,760. Others who cashed included Carrel’s good friend Ben Heath (who also joined the English commentary team), WSOP November Niner Michiel Brummelhuis, former winner David Boyaciyan plus EPT champions Anton Wigg and Jan Bendik. Former EPT Player of the Year Ole Schemion took down the Super High Roller while EPT Dublin champion Noah Boeken scooped the High Roller. The next big event coming up in the Netherlands is the Dom Classics in Utrecht in January. The next event in Amsterdam will be the WPT in May 2017. Holland Casino also announced last week that a World Series of Poker International Circuit will be held in Rotterdam in the fall of 2017.